Sheridan, Richard Brinsley; Illustrated by Hugh Thomson. London: Hodder & Stoughton, c. 1911. 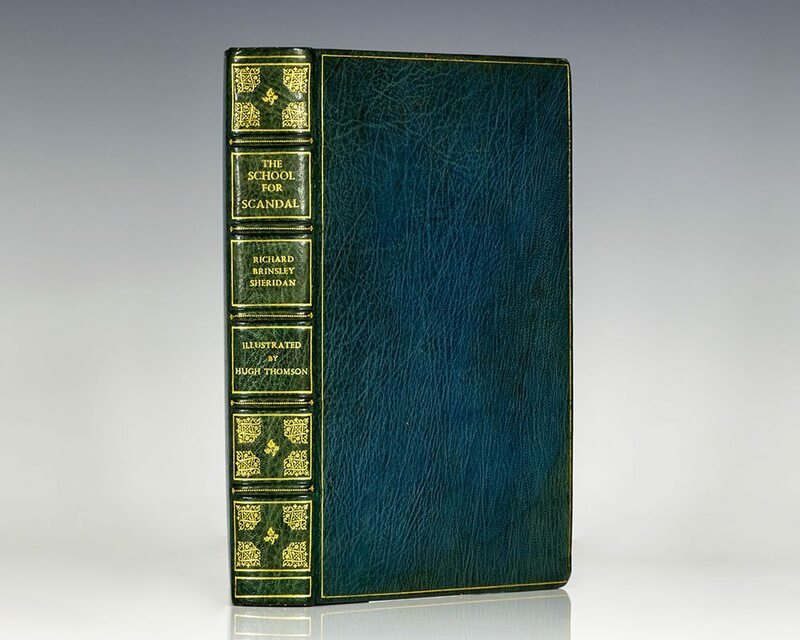 Finely bound by Asprey. Quarto, bound in full morocco, gilt titles and tooling to the spine, raised bands, gilt ruled to the front and rear panels, gilt turn-ins, all edges gilt. Illustrated with 25 tipped in color plates by Hugh Thompson. In near fine condition. The School for Scandal is a play written by Richard Brinsley Sheridan. It was first performed in London at Drury Lane Theatre on 8 May 1777. It has been widely admired. The English critic William Hazlitt was particularly effusive in his praise of Sheridan's comedies in general ("everything in them tells; there is no labour in vain") and of this play in particular: The School for Scandal is, if not the most original, perhaps the most finished and faultless comedy which we have. When it is acted, you hear people all around you exclaiming, "Surely it is impossible for anything to be cleverer." The scene in which Charles sells all the old family pictures but his uncle's, who is the purchaser in disguise, and that of the discovery of Lady Teazle when the screen falls, are among the happiest and most highly wrought that comedy, in its wide and brilliant range, can boast. Besides the wit and ingenuity of this play, there is a genial spirit of frankness and generosity about it, that relieves the heart as well as clears the lungs. It professes a faith in the natural goodness as well as habitual depravity of human nature. Edmund Gosse called the play "perhaps the best existing English comedy of intrigue", while Charles Lamb wrote that "This comedy grew out of Congreve and Wycherley", but criticized "sentimental incompatibilities" even while admitting that "the gaiety upon the whole is buoyant." The play has been adapted to film numerous times. In 1923, the silent British film The School for Scandal was made by Bertram Phillips. It starred Basil Rathbone, Frank Stanmore and Queenie Thomas. The 1930 The School for Scandal was the first sound adaptation.